There are around half a million homeless people in the UK and twice as many empty properties. Just one of the many contradictions of capitalism. Both Jesus and Gandhi used nonviolent direct action to oppose the political elite of their day who oppressed and exploited the middle, working, and impoverished classes. Jesus used fun (turning water into wine), surprise (turning over the tables in the temple market), and his own humanity to expose inhumanity and joylessness in the status quo. That's what these guys did! So why aren't Christians doing this kind of thing? Some are but few; most of us are just looking on in awe and a certain amount of trepidation. 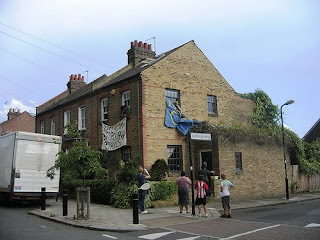 From Indymedia: A group of housing activists have entered and occupied the house of Anne and Alan Keene. Both Labour MPs they were known as “Mr and Mrs Expenses” two years before the MP spending scandal broke; Mrs Keen, a health minister recently admitted making an expense claim for private hospital treatment for a member of her staff. At the centre of their scandal was their double mortgage claim, where they illegally used Parliamentary expenses to pay interest on the mortgages of both their homes – one of which has now been occupied by outraged locals along with activists from all backgrounds and nationalities. It was revealed several days ago that they faced having their Hounslow constituency home repossessed by the council after leaving it empty for over a year. The £385,000 three-bedroom terrace was being renovated whilst they stayed in their central home London near Parliament which they billed the public £137,679 for. After an alleged falling out with the builders the house was left empty, but at a local residents meeting a member of the public alerted activists to the location of the house, and 2 days ago it was occupied. Speaking by phone one of the occupants explained why they had taken the building and what they wanted to happen.